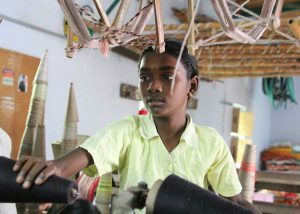 The main aim of the project is to abolish exploitative child labour in Gujarat’s cotton industry. It hopes to free some 1,500 children from exploitative child labour during the term of the project. The project includes various components designed to improve the living conditions of migrants and marginalised families in the region. This involves abolishing child labour, ensuring access to high-quality education and improving health. The project helps families to realise new sources of income by setting up small businesses or providing services. The families receive training and extensive support, and microloans are made available. The project partners are also promoting the expansion of sustainable farming methods to reduce health risks and increase yields. These measures are designed to tackle poverty, which is often the cause of child labour. This project follows on from other projects with the two project partners: there has been cooperation between Terre des Hommes and Ganatar since 1996 and between Terre des Hommes and Anandi since 2002. The project is fully financed by C&A Foundation.